If you’re a billiards enthusiast, then this 3D Pool game App for iPhone is perfect for you. This new iPhone game gives you more than just a good round of pool – it also brings forth a 3D experience for your high-tech gaming needs. Play 3D pool in a game that is patterned after the rules of the 8-ball billiards game, better known as the American billiards. The objective of the game is basically the same. You have to pocket all the balls, both solids and stripes, until you get to the black eight ball in as few strokes as possible. While this Pool iPhone game is predominantly offered in the 3D mode, it is also possible to play it in the 2D mode. You can toggle between these two modes by simply selecting the mode that you prefer. 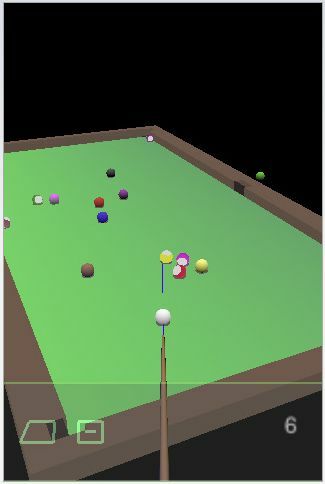 The perspective mode is also referred to the 3D mode, where the billiard table and balls are seen at an angle. The top view mode pertains to the regular 2D mode of the game. In an iPhone or iPod Touch, the controlling the 3d Pool iPhone game is as easy as pointing to the direction you want the cue ball to go. Playing the game is as easy as touching and dragging portions of the game area. Releasing your finger would initiate the shot. 3D Pool game app for iPhone and iPod Touch gives you a whole new dimension in your regular iPhone billiards game. Priced at less than a dollar, this game is the perfect pass time for pool fan like you. Try it and see for yourself how different the interface the game has. And you’ll surely get addicted to it. The 3D feel of the game allows you to enjoy the game like it is played in the real world. A lot of sports-inspired games have come out on the iPhone. And each one of them has gotten better over time. This new 3D Pool iPhone game is worth trying and that’s a guarantee. You could buy this great iPhone 3d Pool Game for only $0.99 here.